Many of us have an old chest freezer or our old fridge from when we bought our shiny new fridge for the kitchen. Now it has been banished to the garage to keep a few block of ice and keep our drinks cold, or just in case we need more cold beer. But how much does that old fridge or freezer really cost us? Could it really be as much as R3 per day!? That would mean if you drank 2 beers every week from the fridge, you’ll pay more to run the fridge, than the beer. Or put it another way, turn off that fridge outside and you’ll net yourself a 2 beer reward (or a bottle of win!) – otherwise known as R20 every week! In the last 10 years fridges and freezers have basically gone from being energy hungry monsters to be little energy sipping angels. This is great news for money-savers everywhere. All this started in 1996 when European Union forced all fridges and freezers to have energy labels on them (like the one on the right), pretty soon after that they started to come up with rules that all new fridges and freezers (as well as other things like washing machines etc.) need to be getting high grades (As & Bs) if they want to sell them in the EU. Right now there’s a law in the EU saying that if you aren’t A+ or above (there’s A+++ now!) then you can’t be sold in Europe. They also did a similar thing in the US with the Energy star system. In South Africa, we don’t really have those rules – but, all that pushing done by the EU & US is help us out too. Lots of manufacturers (Bosch, Samsung etc.) are international and so just end up keeping those rules when they sell in SA. So what’s this all mean? It means for the same size/shape fridge or freezer a new one you buy today will use MUCH less energy than an old one. How much? It really depends on EXACTLY what size and shape of fridge or freezer you have and how old it is. From our experience we’ve seen old fridges and freezers using anywhere from 3 to 10 units per day. The newest latest fridges use WAAAAAYYY less – most are under 1kWh per day, and some as low as 0.5 per day. Luckily someone has already done most of the hard-work for us. This is based on US data for a pretty massive 620L Fridge Freezer (or 22 cubic foot), the energy consumed per year has dropped from over 2000 units per year in the 1970s to around 500 per year now and as low as 300 with the best in class in 2014. But they are all in the US, so what’s it really like locally? KIC Fridge 336L:. I’m not sure how old this one was, but it’s a pretty common model that I’ve seen before – and often in people’s garages keeping drinks cold! 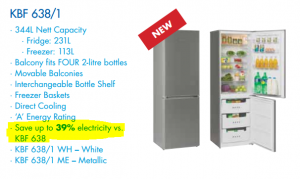 So a NEW KIC fridge of around the same size – the KBF638 says it uses 39% LESS energy than the previous model, and it uses 368 kWh/annum (see here for more details). This means the previous model used 600kwh/year (368/0.61). If your electricity costs R1.65, then that’s the same as R1000 per year to run that old fridge. That’s where the headline comes from above. R1000 per year to run a fridge. That’s around R3 per day. The new version of that same fridge by KIC will only cost R600 per year I don’t want to get down on KIC, I’m sure they make great fridges, but even the latest model isn’t really very efficient. A similar size, top of the range fridge with a A+++ rating (like this one) – only uses 149kwh/yr – or around R240/year! Is it worth replacing an old fridge with a new one? So changing from an older fridge to the best latest one could save you around R750 per year on your energy bill – that would be changing from a bog-standard 1990s KIC one to the top-of-the-range Bosch A+++ rated machine. Unfortunately I can’t find that Bosch fridge freezer in South Africa, but looking around the stores recently I think you can get Samsung A+ rated fridge freezer for around R6,800 – this uses 300 kwh/year. If you were replacing an older KIC model from above, with a new Samsung, you’d cut your energy bill by 300 units per year (according to the specs!). That would mean you’d save R480 each year with a tariff of R1.60/kwh. If your in a more expensive area (e.g. Cape Town), where the tariff goes up to R1.86/kwh, then you’d save R558 every year. Also electricity prices are increasing every year – by at least 8%. That would mean next year you’d save R605 and the year after R654 and so on. By my calculations it would take 8 years to pay-back your investment… which isn’t great! So if the fridge lasted the full 10 year guarantee, you’d only have around R1200 profit from your investment. To put it another way, if you put your R6900 into an RSA savings bond (at around 7% interest) rather than a new fridge, you’d end up with R13,500 in your pocket after 10 years, compared with only R8,200 of savings from the fridge [it would be the same as a 3% interest rate]. Then again, if your old fridge breaks down, or if you just fancy a nice new fridge, we could certainly recommend factoring in the energy rati ng. An easy way to think about it is, if you plan on keeping it for ten years, its worth paying R1000 more for every 100kWh the fridge saves* – and luckily most appliances will tell you! 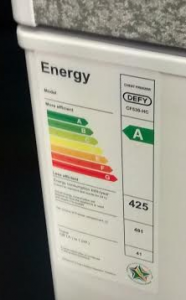 Have a look for this label on the appliance – it’s that big number (425)- times your tariff, that SABS think you’ll be spending every year on this appliance. Obviously if you use it more/less it will change, but for fridges, that number is pretty accurate. 1. If you have an old, spare fridge that you’re not really using very much – just keeping a few drinks cold etc. – then switch it off. You don’t need to do anything special just unplug it. We’d probably recommend cleaning it out and then keeping the door just slightly ajar so it dries out and doesn’t get all mouldy. But the important thing is to SWITCH IT OFF if you aren’t really using it. If you really want a nice cold beer, either use your other fridge, or go to the pub — you’ll save enough for that first pint EVERY week. 2. If you have a old fridge that you’re using as your main fridge, it’s unlikely to be worth replacing it. At least not until it breaks, or if you’re paying much more for electricity. If you’re fridge is VERY old, from the early 1990s, then maybe it would be worth replacing it. The only way to be sure would be to see how much your fridge is using right now, using an energy monitor or a Homebug! When you are buying a new fridge remember our little handy tip. Spending R1000 more you need to save 100kWh per year to make it worthwhile*. * – R1000 at 10% interest rate, paid back over 10 years would cost you R160 per year. At current electricity prices, that’s about 100kWh. Admittedly if you can only get 5% interest on your money, and electricity costs R2.50 (as it will do on average over those 5 years), then it could be close to 50kWh needs to be saved per year for every R1000 extra. Conversely if your buying it on credit at 30% interest , you’ll need to save 200kwh per year to make it worth while. I also have an old fridge back in garage and I can tell you it sucking my money. I will have to get rid of it right away. Thanks for explaining this. You don’t need to get rid of it… just switch if off! Always handy to have if there’s a big party coming up or something. Just make sure to clean it out and make sure it’s dry — otherwise you’ll get some serious mould growing in it! I work for an energy efficient company that has a patent on an alternative element that uses PTC (positive temperature co-efficient) technology as opposed to traditional resistance wire heating. It will reduce the hot water consumption by 50% or more. To find out more about this unique technology, please feel free to leave a comment. Would love to hear more about why you think it could be though! Looks like 2 years to me! PS – if DIYDEPOT want to help people save energy – then give me a shout. I’m sure we could get a few Homebug’s into your stores! Rich I need a small chest freezer around 200ltr .Which A++ is available in chest type , either I miss it or need glasses. what about the defy chest freezer with the 95 watt compressor?